Wolverhampton’s world-class Initial Access gallery goes minimalist this Autumn, with a major new show. Possibly the most interesting show in the Midlands so far announced, for this coming Autumn. Minimal Means (8th September – 12th December 09) will be the seventh exhibition at Initial Access and will feature John M Armleder, Mathias Bengtsson, Dunne & Raby, Gardar Eide Einarsson, Olafur Eliasson, Gregor Hildebrandt, Sergej Jensen, Shiro Kuramata, Kenneth Noland, Richard Prince, Anselm Reyle, Rudolf Stingel, Katja Strunz and Lee Ufan. 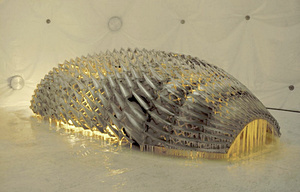 “Your mobile expectations: BMW H2R” by Olafur Eliasson.